It's tracking at 8.8 on IMDB, putting it 4/10ths of a point higher than Braveheart. 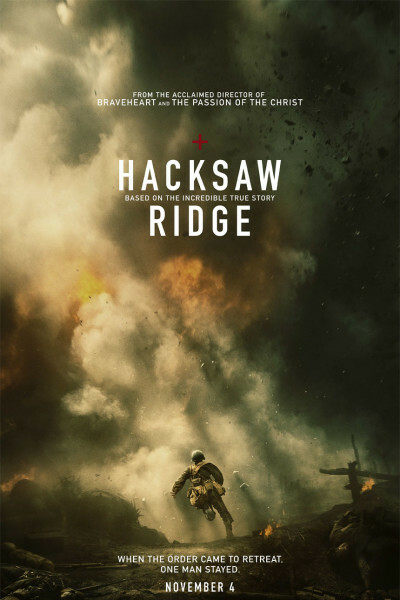 Hacksaw starts strong, and Mel Gibson has orchestrated some tremendous battle scenes that'll punch you right in the stomach and leave you gasping for air. But it's a bit too glossy, literally, feeling very digital vs. analog. I don't like movies that look this way, as if they were filmed on a Mac versus good ol' filmstock. Alas, Hacksaw tugs at your heartstrings, and succeeds much of the time, but it also panders a bit. Not a lot, but perhaps 10% too much. I don't know; I think I'm being too harsh. I know I am; I apologize. It's a really, really beautiful movie, and I *enjoyed* it very much, if that's the right word. Kinda heretical to say one "enjoys" a war pic, me thinks. Anyway, at an 8.8, well, I expect more. Bottom-line, Yes, I'd suggest you see Hacksaw Ridge, if only to be reminded that there are some amazing people left. And in a nation as divided as ours, we need all the heroes and good guys/gals we can get. Don't get me started. There's just so much rubbish on the national stage these days that it makes me sick thinking about it. Which dumpster fire do you want? I guess whichever one burns the least brightly. Meantime, sure, go getcha some Hacksaw. You can reminisce about a country united. p.s. A dear friend and colleague has shared his own thoughts on Private Doss, whom he had the privilege of meeting in 1985. May his recollections be as encouraging to you as they were to me.